The Vining Group at Keller Williams provides Lake Oconee Market Statistics to keep you informed on what’s happening in the Lake Oconee real estate market. The charts below show what’s happening in the various communities within the Lake Oconee area, broken down into the number of For Sale and Sold homes and lots for January through March 2019. For questions regarding the local real estate market, ASK The Vining Group at Keller Williams. This information was gathered from the LCBOR MLS on 4/16/2019 and is deemed reliable but not guaranteed. We are your local real estate experts with global reach! Ask Vining how to make your real estate dreams come true! We take the time to analyze the Lake Oconee real estate market because it helps us provide the best experience to our clients. With Spring Break and the Masters having come and gone, the buying/selling season is in full swing! There was a total of 59 real estate transactions: 44 residential properties and 15 land lots in March 2019. The lake life is in demand and we are prepared to accommodate! Ask Vining, if you are ready to buy or sell your Lake Oconee area property. We see value in our understanding of where the market is at and providing clarity on the market to our clients. Transparency is key. Below you will find a detailed breakdown of the properties sold in March 2019. This information was gathered from the LCBOR MLS on 4/10/2019 and is deemed reliable but not guaranteed. 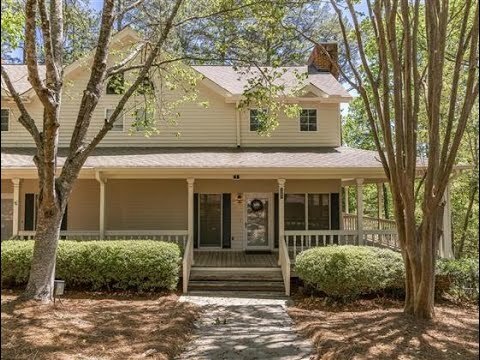 Move Right in to this Well-Maintained and Recently Updated Golf Cottage in Reynolds Lake Oconee, next to the Preserve Club House. Enjoy all that Reynolds has to offer with a Convenient location within walking distance to 88 Kitchen & Cocktails, the Preserve Club House, driving range, tennis courts, bocce ball, fitness center, playground, and swimming pool & pavilion. Recently painted inside and out, it has a great floor plan featuring 3 bedrooms and 3 bathrooms on three levels; a unique one for the Club Cottage Area. The Master suite features soaking tub, separate shower, private balcony, and fireplace. This is a great home for investment or as a great escape as a second home. The seller is making a golf membership available. $250,000. Call or text 706.686.5033 for more information! Posted in Market Reports: Lake Oconee Real EstateLeave a Comment on Reynolds at its Best! Move Right In! Don’t miss out on this one! Located on a quiet street in a cul-de-sac, it features 3 beds/2 baths, wood laminate flooring, spacious walk-in closets, garden tub, 2-car garage, rocking chair front porch, rear patio, and easy maintenance vinyl siding. A wonderful investment property, first home, & downsizing option. Located in the heart of the Lake Oconee area – close to everything! A steal at $144,900. Call or text 706.686.5033 for more information! This Lake Oconee home has it all! Beautiful main lake location with deep, clear water, renovated kitchen & master bathroom, new carpet in all bedrooms, and new paint. An ideal floor plan for entertaining with a spacious and open upper GR, sun room, large back deck, and kitchen overlooking the lake. Downstairs is another spacious and open GR, covered rear patio and easy walk to the max dock. Enjoy a view of the lake from most ever room in the house. The exterior boasts low maintenance brick and recently painted Hardie board. Come enjoy all Lake Oconee has to offer in this exceptional waterfront home with great water depths, main lake views, and well maintained home. A must see! Posted in Market Reports: Lake Oconee Real EstateLeave a Comment on Move Right In! Rustic Luxury on Your Mind? 🔻 E X H A L E 🔻 That’s the very first thing you’ll do when you enter the front door of this gorgeous authentic log cabin on some of the deepest, clearest water on Lake Oconee. This home is in pristine condition with beautiful lake views. Perfectly positioned just inside a protected wide cove with huge boulders and super deep, clear water. Outside, you’ll enjoy a private max composite dock with boat and jet ski lifts and beautifully-landscaped shoreline with granite-capped seawall. This Immaculate property is truly cared for and you notice this when you first turn onto the driveway. Fabulous open main level floor plan with exposed high-beamed ceiling and fireplace. The master BR has lake views and private bath with separate shower and tub. Also located on the main level are 2 additional bedrooms, a full bath and large laundry and pantry area. On the terrace level is a 2nd living area with kitchenette and wonderful lake views. 4th BR, 3rd full bath and hobby/gym/flex space currently used as a 5th BR also located on lower level. Also features a built-in computer desk area, amazing woodworking workshop with state of the art set up and air filtration system. This room could easily be converted to an additional master suite. Wonderful covered deck that spans the entire lakeside of the home overlooking gorgeous backyard landscaped with azaleas and other flowering trees and perennials. To top it all off, there is RV storage and 2-car garage! Welcome to your true lake escape! Call or text us today for your private tour! Posted in Market Reports: Lake Oconee Real EstateLeave a Comment on Rustic Luxury on Your Mind?